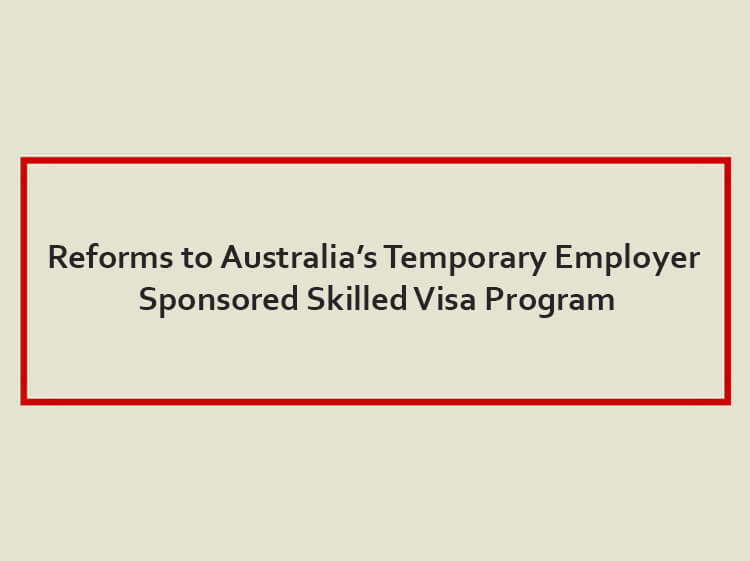 As most readers would be aware, the Turnbull government announced in April 2017 sweeping changes to the current 457 program, soon to be abolished and replaced by the TSS visa in March. The changes saw many occupations on the previous occupation list totally removed, leaving many applicants in limbo and many other occupations with additional caveats and restrictions on future pathways to permanent residency. Changes have also been made to the current ENS and RSMS program and come March, the previous popular pathways utilized by Australian employers to bring in skilled overseas workers are set to cause repercussions throughout many industries that often rely on our skilled work pathways to cope with local labour market shortages. As the government continues to release further information closer to the March date, we are beginning to get a full picture on the implications of such changes. An article published on the Age on 20 January 2018 has brought to light the impact of these changes. Australian National University researcher Henry Sherrell has found the number of primary 457 visas granted in the 2017 September quarter was down by 35.7 per cent on the same period of 2016. This significant drop however, was not attributed to by the occupations deemed ineligible, but mostly by double-digit declines in top 10 occupations under the 457 program which included Developer Programmers, which dropped by 42%, ICT Business Analysts, dropped by a whopping 49% and Cook down 29% to name a few. Australia had new-record employment growth law year, this drastic decline in 457s had nothing to do with demand for labour, but rather employers and potential employees not taking up this pathway due to additional costs and reduced permanent residency pathways. From March 1, employers wishing to utilize the TSS visa will find that there will be only 183 occupations eligible for a TSS visa that will lead to permanent residency, 252 more occupations will be available however, on a two-year visa that can be extended only once with no permanent residency pathway. The availability of permanent residency makes an immediate difference to applications. Add to this the increased scrutiny on ‘genuine positions’, higher visa costs and a new training levy. In a nutshell, the golden age where employers were able to sponsor skilled staff and get them onshore quickly to relieve labour shortages are pretty much gone. Unless an employer has the luxury of access to a labour agreement, 457 visas are taking now anywhere between 3 months to 12 months or more for a decision, add in there requests for further information which occurs too frequently these days, employers and visa applicants are left hanging and hanging, and unfortunately, there is not much we can do. Come March, I foresee even further repercussions as various industries including the migration profession scramble to understand new regulations, new policies and brace for regular changes as a norm for the Australian migration programme. Employer sponsored visas have traditionally been a program where professional migration legal services have been highly utilized. However, as costs rise for employers and visa applicants, it will be envisaged that more and more will look at preparing applications without professional assistance. Anecdotally, what this means is that there will be more applications knocked back for being incomplete, further requests for additional information which prolongs the application process, a burden on the already lengthy process and more burden on the merits review system which currently suffers from huge backlog. But, Australian migration law has always been complex, and the complex it gets, the more need for employers and visa applicants alike to engage professionals in the industry who can competently guide them through the now extremely arduous process of 457, 186, 187 and the various agreements available. Southern Stone International handles a high volume of employer sponsored visas and we ensure all clients are provided with up to date and reliable professional advice. We view this challenging time in the industry as an opportunity for us to work harder to ensure positive outcomes for our clients. Please call or email us now for a consultation NOW!